The core of any filmmaker’s soul is to commit and explore the realm of a targeted subject matter regardless of said filmmaker’s familiarity with the material at hand. 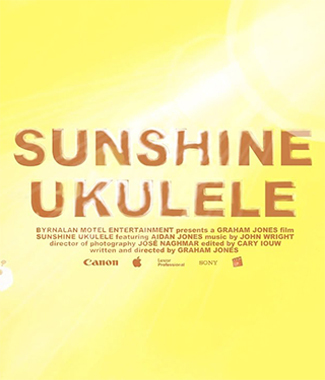 Well, Irish filmmaker Graham Jones (“How to Cheat in the Leaving Certificate”) does not disappoint with his latest go-around regarding adventurous youth and the creative spirit in the masterful and melodic independent drama, Sunshine Ukulele. Here the insightful and perceptive Jones pulls off the imaginative feat of turning the unheralded reputation of the ukulele into a hip tool of expression, excitement and exploration. What earnestly drives Sunshine Ukulele is Jones’ recurring themes rooted in the psyche of his young protagonists questioning the self-discovery and curiosities of life in general. Whether spotlighting the familial cultural pride of a gifted youngster in the thought-provoking “The History Student” or testing the urban temperature of quiet young womanhood angst and despair of a homeless prostitute in 2016’s reflective “Nola and the Clones,” Jones resourcefully relies on the dependable formula of nagging introspection. Plus, one is able to relate to Jones’ (and his vulnerable on-screen characters) sense of conviction and clarity given the challenges in the simple, but solidly sharp, storytelling that methodically unfolds. The film tells the tale of an uncle buying his young nephew an unusual birthday gift — a ukulele. We realize how typical the lad is for his age because we first meet him playing LEGOs and wearing a Star Wars storm-trooper mask before he opens the package and discovers the instrument inside. The nameless boy is understandably intrigued by his uncle’s brand of gift as it is certainly different and unconventional. Nevertheless, the kid is determined not to be mystified by the musical instrument and immediately takes the necessary steps to handle the plucky plaything. Amusingly (and rather sweetly) the boy decides to patiently tune into J.B.’s Ukulele Club to receive instruction on how to play his birthday present, but not before browsing online and checking out some of the famous faces that were joined at the fingertips with their trusty ukuleles. Household names such as the trio of Bob Hope/Bing Crosby/Dorothy Lamour, Elvis Presley, British comedian Benny Hill, country crooner Hank Williams and legendary blues singer Robert Johnson pop up on screen for the boy to observe with wonderment. Interestingly, Jones uses his little leading man as our personal tour guide, unlocking the mysteries and treasured truths (or perhaps uninformed popularity) of the seemingly underappreciated ukulele. As Jones penetrates his inquiring Boy Wonder with laptop images and videos of famous and no-so famous people, he is in essence schooling the viewer about this remarkable instrument as much as the freckled-faced boy. We see how the ukulele is worshiped comically by Lucille Ball’s zany antics on her classic 1950’s sitcom and how British rocker Elvis Costello poignantly plays the ukulele on an American talk show (Craig Kilborn) from yesteryear. Also, there are extremely talented unknowns playing the ukulele like nobody’s business and the occasional cheeky and over-the-top show-offs equally impressing the boy (and yes . . . us the viewer) with skilled finesse in turning the ukulele into a decorative device of sound and emotion. A personal favorite scene has the group of ukulele-playing Cambridge City Council Arts and Culture participants (specifically the Ukulele Orchestra of Great Britain) jamming to their finger-snapping rendition for The Theme from Shaft . . . something that would definitely make the late Messiah of Soul, Isaac Hayes, smile with approval. Even the unassuming power and influence of the ukulele did not escape the playful preoccupation of mighty notables ranging from multi-billionaire Warren Buffet or New Jersey rock icon Jon Bon Jovi. Dutifully, Jones demonstrates other means to illustrate the ukulele as a symbol of inclusion and triumph as he features other inspired ukulele musicians — young and old — as they make merry music in the classroom, on traveling buses and at the climax of the film where the impressionable boy roams around at the local Ukulele Hooley music festival. No doubt that Sunshine Ukulele may be an acquired taste that may take some to warm up to gradually. Nevertheless, Jones has managed to combine the fascination of an obscure musical instrument and turn it into a contagiously delightful commentary on the consumption of media forces online, in music and at the movies. From Jones’ own lips he has quipped, “Music and movies are very intertwined, almost like sibling mediums and ukulele players sometimes remind me of indie filmmakers!” Brilliantly conceived (with an impishly rewarding turn by Jones’ young, inquisitive actor) and woven together with a winning series of quirky and crafted showmanship in the various musical clips, stills and live performances, Sunshine Ukulele is an absorbing allegory that marries the underappreciated artistic process with the nobility of recognition and accomplishment. Finally something unique. I can’t wait to see it. Nice review too.